Hydraulic Jacks: What Are They? 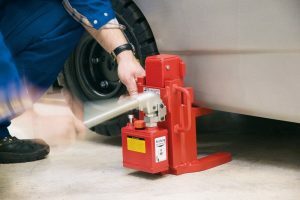 Hydraulic Jacks: What Are They and How Do They Work? Jacks are commonly used lifting devices. There are many different types of hydraulic jacks, and they use a variety of different kinds of technology. But what exactly are they and how do they work? A hydraulic jack is a device that uses hydraulic fluid in order to lift heavy loads. Its main component is a cylinder, into which hydraulic fluid is pumped. The resultant pressure created inside the cylinder then pushes up the plate of the jack, which is capable of lifting extremely heavy objects. Oil is typically used as the hydraulic fluid, as it also lubricates the components of the jack, ensuring everything is in working order. The pumping system is used to pump the hydraulic fluid into the cylinder through a one-way valve. It can be either hand or mechanically powered. Since the valve is one way, the pumping system pushes the fluid into the cylinder, but does not allow it to escape. as any heavy load that rests on top of it. The cylinder is designed and built specifically to cope with the extreme build-up of pressure inside it. Any structural failure in the cylinder or the one-way valve can cause the hydraulic jack to collapse. In order to release the pressure build-up inside the jack, the one-way valve can be simply released. This allows the hydraulic fluid to flow back out of the cylinder, and the plate to return to its starting position. There are 2 main types of hydraulic jack: floor jacks and bottle jacks. Also known as garage jacks or car jacks, floor jacks are used primarily to lift objects from the floor. Bottle jacks are named after their long-necked bottle shape. They are particularly useful for squeezing into tight spots and are commonly used in construction work. Hydraulic jacks can be used for a variety of different lifting purposes. By exerting pressure on a hydraulic fluid within an enclosed space, they are able to generate enough force to lift extremely heavy loads. To find out more about hydraulic jacks, contact HTS Direct today.